….It’s that time of year again…. 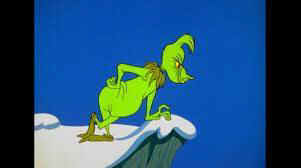 The Grinch hated hunting! The whole hunting season! Now, please don’t ask why. There are many good reasons. It could be because hunter’s heads aren’t screwed on quite right. It could be, perhaps, that their belts are too tight. May be that their hearts (and other parts) are two sizes too small. Their rifles, their shotguns—all things that destroy! I MUST stop hunting season from coming! GOT A WONDERFUL, BRILLIANT IDEA!